Lockheed Martin Space Systems Co. hopes to cut the time to manufacture a satellite from as long as 48 months to 18, according to Dennis Little, vice president for production. "If you're going to build a titanium tank for a satellite that we currently build, you have to buy a billet of forged titanium, and the latent time is 14 to 18 months to get it from the supplier, and then you have to machine it down to its final geometry," Little says. "This machine, the Sciaky, lays it up bead by bead, and then you machine it to the final thickness, and you have two spheres and probably a barrel section for the final tank geometry. So you get a tank for a small satellite, machined in three pieces, and within a week's time." "While there are many high deposition rate AM machines out there, most of them have not built a single part that has made it to production. As for myself, I am a firm believer that real-world experience holds more credibility." "Burloak’s space industry customers are beginning to think additively"
"EBAM system will 3D print large metal parts for prominent OEMs, making Burloak Technologies the first EBAM Parts Bureau in Canada serving aerospace, defense and other industries..."
"The innovators at Burloak Technologies will leverage the numerous benefits of EBAM to produce faster and cheaper parts for their customers all across the globe..."
"Sciaky’s EBAM systems are the most widely sold large-scale metal 3D printing system in the world, having qualified parts on land, sea, air, and space applications..."
"FAMAero will utilize Sciaky’s Electron Beam Additive Manufacturing system (EBAM) to cut down on production time and costs associated with traditional manufacturing methods..."
"FAMAero will leverage the technology to provide fast, affordable large-scale 3D printed parts and prototypes..."
"The custom EBAM system ordered by FAMAero will be the largest production metal 3D printer in the world..."
"Plans to use Sciaky’s scalable, large-format technology to offer fast and affordable parts and prototypes..."
New 3D printing bureau FAMAero acquires custom EBAM system Sciaky Inc.
"Sciaky’s EBAM system is, as most in the industry will know, one of, if not the most, scalable metal AM systems on the market..."
"FAMAero is the first private, dedicated parts bureau in North America for large-scale 3D printed metal parts..."
"FAMAero is well-positioned to be North America's go-to source for fast and affordable metal 3D printed parts and prototypes..."
"FAMAero’s services will be particularly appealing to customers in aerospace, defense, oil & gas, and sea exploration industries..."
"Custom EBAM system will be the largest production Additive Manufacturing machine in the world..."
"The certification comes at the tail end of of a multi-year partnership between Lockheed Martin and Sciaky..."
"Lockheed Martin printed both halves of the 46-in. titanium fuel tank domes on an American-made Sciaky EBAM 110 machine..."
"Technicians at Lockheed's facility in Denver used Electron Beam Additive Manufacturing to 3D-print a pair of titanium domes with a 46-inch diameter and 4-inch thick walls..."
"Lockheed Martin has created a 3D-printed titanium dome for a satellite fuel tank so big that you can't even put your arms around it..."
"High-tech, high-value components are making it possible to demonstrate the potential for AM in critical high-tech applications..."
"Building huge fuel tanks via 3D printing could show how new manufacturing will revolutionize the launch industry..."
"Lockheed Martin has embraced a 3-D printed titanium dome for satellite fuel tanks so big you can't even put your arms around it..."
"Measuring at 46 inches in diameter, the titanium domes which were fabricated using Sciaky’s Electronic Beam Additive Manufacturing (EBAM) technology, are Lockheed Martin’s largest 3D printed parts..."
"Lockheed Martin, a global security and aerospace company based in Maryland, has produced two large titanium 3D printed domes for a high-pressure tank responsible for holding fuel on-board orbiting satellites..."
"Including the middle tank, the titanium vessel is about 8 ft. tall..."
"Lockheed Martin reduced production time of the fuel tank domes by 87 percent while reducing delivery time from two years to three months..."
"Sciaky’s EBAM technology is now the world’s only large-scale metal 3D printing process that has qualified applications for land, sea, air, and space..."
"The 3D printed dome completed final rounds of quality testing this month, putting an end to a multi-year development program to create high-pressure tanks to carry fuel on board satellites..."
"The 46-inch titanium fuel tank domes, produced with Sciaky’s industry-leading metal 3D printing technology by Lockheed Martin Space, will be the largest additively manufactured parts in space..."
"Stemming from the completion of qualification testing performed by Lockheed Martin Space on a multi-year development program..."
"Sciaky announced that they have entered a strategic partnership with Concurrent Technologies Corporation to support a growing demand for high quality, large-scale additively manufactured metal parts..."
"EBAM systems, which lower material waste and costs, lead times, and machining times..."
"CTC will offer Sciaky’s industry-leading Electron Beam Additive Manufacturing (EBAM) metal 3D printing technology to its diverse range of innovative manufacturing clients..."
"CTC has a 30-year history in metals and metal processing solutions and is well known for providing innovative laser powder bed fusion, hybrid additive manufacturing, and cold spray solutions to its clients... "
"CTC to Leverage Sciaky’s Electron Beam Additive Manufacturing (EBAM) Technology to Provide High-Quality, Large-Scale Metal Parts Faster than Ever..."
"We are grateful for this opportunity to collaborate with the talented team at Sciaky. Our clients will realize numerous benefits thanks to this arrangement..."
"Sciaky is excited to work with CTC and help educate its clients about the real-world benefits of EBAM technology..."
CTC To Offer EBAM Metal Printing Through New Partnership with Sciaky, Inc.
"When compared to traditional forging methods, EBAM offers significant competitive advantages for customers all over the world by drastically reducing production time, waste, and costs associated with manufacturing large, high-value metal parts..."
When will AM make sense as a job shop option? "New material deposition systems are moving metal printing capabilities forward as an option for building complex components and adding features to traditionally fabricated parts..."
"How researchers are reducing limitations and expanding 3D printing into manufacturing..."
"Sciaky is proud to extend our industry-leading technology with Hitachi Metals..."
"Sciaky Inc. has seen an Electron Beam Additive Manufacturing (EBAM) system installed in the Asia-Pacific for the first time as Hitachi Metals took delivery of the platform..."
Sciaky Delivers Industry-Leading Electron Beam Additive Manufacturing (EBAM®) System to Hitachi Metals, Ltd.
"This is an important milestone for the industrial metal 3D printing market in Japan, and the forward-thinking leaders at Hitachi Metals are blazing a new trail for the Asia-Pacific region..."
"The system features a dual wire feed configuration with which users can combine two different metal alloys into a single melt pool..."
"For metal 3D printing, the largest commercially available machine is Sciaky’s EBAM (electron beam additive manufacturing) 300 Series, with a build volume of 228 in x 48 in x 96 in..."
"The most widely scalable metal AM systems in the industry..."
"Sciaky is proud to deliver more best-in-class EBAM metal 3D printing systems to the marketplace, which will be leveraged in a wide range of land, sea, air and space applications." 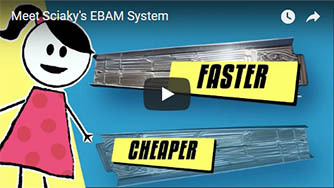 "Now, more than ever, manufacturers are looking for ways to reduce time and cost associated with producing large, high-value parts, and Sciaky EBAM systems have a proven track record of helping manufacturers achieve these business-critical goals." "January is shaping up to be another great month for EBAM machine sales, and there will be more exciting industry news coming from Sciaky in the near future." "Four state-of-the-art Electron Beam Additive Manufacturing (EBAM®) systems from Sciaky Inc., a subsidiary of Phillips Service Industries, Inc. (PSI), were sold in the month of December, a record." "In December 2017 Sciaky Inc. made company history, posting record sales of four Electron Beam Additive Manufacturing (EBAM) systems." "The EBAM systems will be used to 3D print titanium structures for aerospace applications, as well as to produce large parts for ground-based military vehicles, and warships." "With Sciaky’s Interlayer Real-time Imaging and Sensing System (IRISS), users can monitor and control the print in real-time, with the system digitally self-adjusting metal deposition with precision and repeatability." "The company’s EBAM 3D printers can produce parts that range in length from 8 inches to 19 feet, and the technology has been used in many high-performance applications"
"Sciaky is honored to receive this prestigious award from the 3D printing experts at TCT, and in conjunction with the visionaries at Lockheed Martin Space Systems." "Lockheed Martin Space Systems reduced costs by 55 percent, material waste by 75 percent, and production time by 80 percent by using the EBAM metal 3-D printing system instead of traditional forging methods." " Sciaky announced today that it won the TCT Aerospace Application Award, along with Lockheed Martin, for the successful production of titanium propellant tanks using Sciaky's industry-leading Electron Beam Additive Manufacturing (EBAM®) technology." "Sciaky is honored to receive this prestigious award from the U.S. Department of Commerce. We are proud to be an American company that exports innovative technology all across the world." "Sciaky's EBAM 3D printing process delivers consistent part geometry, mechanical properties, microstructure, and metal chemistry, from the first part to the last." "the award is awarded by the U.S. Department of Commerce to afford suitable recognition to persons, firms, or organizations that contribute significantly in the effort to increase United States exports, with a focus on innovation, sustainability, and work of broad impact." "EBAM brings quality and control together with IRISS® – the Interlayer Real-time Imaging and Sensing System..."
"Sciaky's EBAM systems can produce parts ranging from 8 inches (203 mm) to 19 feet (5.79 meters) in length..."
"EBAM is also the fastest deposition process in the metal additive manufacturing market, with gross deposition rates ranging from seven to 20 lbs. (3.18 to 9.07 kg) of metal per hour..."
"We are proud to be an American company that exports innovative technology all across the world." "...the only real-time monitoring and control system in the metal 3D printing market that can sense and digitally self-adjust metal deposition with precision and repeatability." “Sciaky Inc. (Chicago) has staked its claim to being the leading provider of metal 3D printing solutions for large parts approved for land, sea, air, and space applications..."
“A note to those who think 3D printing is a gimmick." “Engineers can 3D print a dome for a spacecraft fuel tank in two weeks." “Sciaky Inc., a metal additive manufacturing solutions provider, is to adopt Siemens’ product lifecycle management (PLM) software products to support its EBAM solution." “Sciaky has announced that it will adopt Product Lifecycle Management (PLM) software technology from Siemens to support its industry-leading Electron Beam Additive Manufacturing (EBAM) solution." “Sciaky is adopting product lifecycle management (PLM) software from Siemens PLM Software to support its electron beam additive manufacturing (EBAM) technology." “Sciaky will use multiaxis deposition technology within Siemens’ NX™ CAD/CAM/CAE software and NX Nastran® CAE software to support its 3-D metal printing systems." “This titanium propellant tank, designed for use in a satellite, was created using electron beam additive manufactuing technology." “Sciaky’s Electron Beam Additive Manufacturing (EBAM) technology relies on metal wire made for the welding industry, fusing the material with an electron beam at a rapid rate." “These large-scale metal 3D printing systems will provide the largest metal parts to aerospace, defense, automotive, and oil and gas manufacturers." “ This innovative closed-loop control is the primary reason that Sciaky’s EBAM 3D printing process delivers consistent part geometry, mechanical properties, microstructure, and metal chemistry, from the first part to the last." 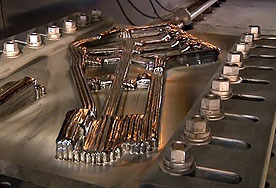 “Sciaky is excited to further expand our one-of-a-kind, large-scale metal 3D printing technology with the marketplace,” said Bob Phillips, Vice President of Marketing for Sciaky, Inc."
"Industrial metal 3D printing company Sciaky has announced an agreement to supply its Electron Beam Additive Manufacturing (EBAM®) systems to “an American-based metal 3D printing parts supplier." "The EBAM 110 system combines computer-aided design (CAD), electron beam directed energy deposition, and layer-additive processing. Starting with a 3D model from a CAD program, Sciaky's electron beam (EB) gun deposits metal wire feedstock in successive layers until the part reaches near-net shape. The system’s vacuum chamber helps to ensure part integrity, Minor finish machining is required after the part reaches near-net shape." "Sciaky is excited to further expand our one-of-a-kind, large-scale metal 3D printing technology with the marketplace," said Bob Phillips, Vice President of Marketing for Sciaky, Inc. "We are also proud that two American companies are working together in the Additive Manufacturing market to provide jobs for American families, without burdening the American taxpayer." "Brian O’Connor, Vice President of Production Operations at Lockheed Martin Space Systems, delivered the news about the 3D printed satellite part, and also confirmed that the company is using large metal electron beam additive manufacturing processes to build rocket fuel tanks. Lockheed’s electron beam 3D printers are supplied by metal 3D printing specialist Sciaky." "EBAM’s unique services within the metal additive manufacturing field are expected to greatly increase the Japanese company’s manufacturing output." "The Sciaky EBAM 110 system has been ordered by an anonymous supplier in Japan. It... will be used to ensure the company remain on the cutting edge of manufacturing progress. Metal additive manufacturing services will be offered to the company’s existing customer base, and the technology will be used to accelerate product development internally." "The manufacturing of the titanium Variable Ballast (VB) tank using EBAM technology took half the time it would have when compared to retooling with a new forging supplier." "When turbine blades are worn down you could either make an entirely new blade or turn to 3D printing. By using Sciaky’s EBAM technology... the worn turbine blade is rejuvenated. The existing blade is put on the 3D printer and new material is added to it. Usually excess material is then removed by CNC or another process. The result? The turbine blade is good as new but at lower cost." "Using EBAM reduced production time from 16 weeks to 8 weeks, and reduced costs compared to retooling with a new forging supplier." "Sciaky helped International Submarine Engineering (ISE) reduce production time from 16 weeks to 8 weeks, as well as reduce overall costs as compared to retooling with a new forging supplier... ISE now plans to 3D print other critical titanium parts with Sciaky's EBAM process." "Sciaky was approached by ISE after the company’s former supplier, a foreign titanium forging facility that produced propellers, was closed. It’s also worth noting that the Arctic Explorer tanks made using EBAM passed the same qualification tests as the UUV tanks earlier created using the forging process." "We’ve seen 3D printing used for space exploration, and now the technology could help with another type of exploration altogether, in a Twenty Thousand Leagues Under the Sea kind of way." "Sciaky has manufactured a 3D printed titanium ballast tank. The ballast tank is an integral part of any water-based vehicle as it provides stability for the vessel. The tank will hold water and will help the submarine dive and emerge." Which is better–additive or traditional manufacturing? Will Sciaky’s Electron Beam Additive Manufacturing technology disrupt traditional moldmaking? Is the Automotive Industry the Fulcrum for Additive Manufacturing? Who Are the Winners in 3D Printer Products and Technologies? DARPA's Open Manufacturing to Fully Unravel Potential of Metal 3D Printing.